The Signs Publishing Company, the Australian publishing house of the Seventh-Day Adventists, moved to Warburton in 1906 having operated before that as the Echo Publishing Company in the Melbourne suburb of North Fitzroy. Like the original factory of the nearby Sanitarium Health Food Company (SHF), the first Signs Publishing building was badly damaged when the River Yarra flooded in 1934. 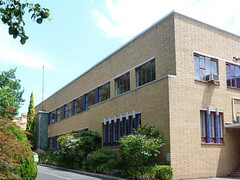 And again like SHF a new building was designed by Edward F Billson and constructed in 1935. 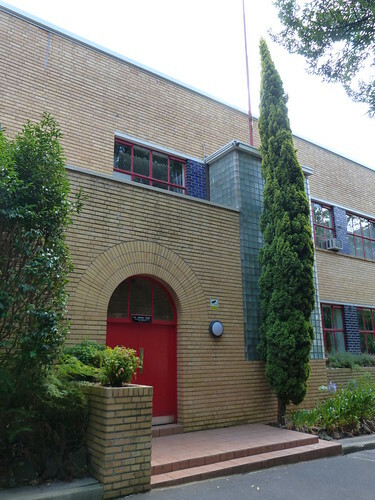 Billson worked with Walter Burley Griffin so it is not unexpected that I can see Frank Lloyd Wright influences particularly in the arched brick decoration surrounding the main door. 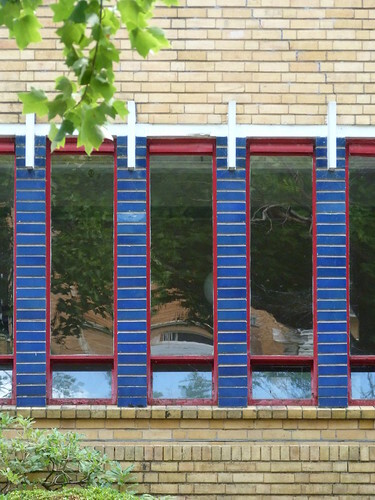 I especially like the use Billson has made of blue bricks to divide the windows contrasting against the red window frames.